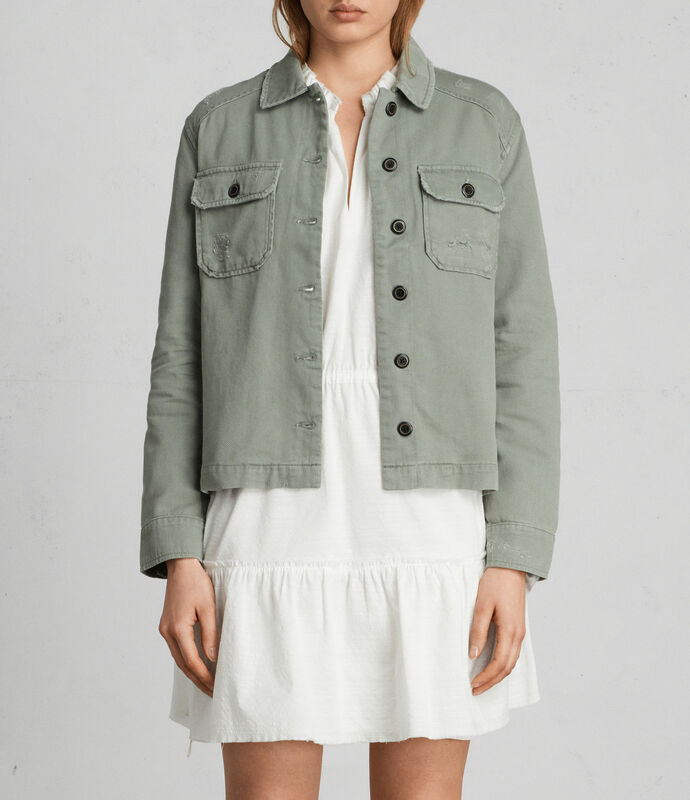 I don’t venture in to Allsaints too often, but when I do I always manage to find something that is not quite my style but that I find myself really wanting anyway. And then other pieces are just directly out of my playbook, like this shirt with the cool gathered sleeves. I could not wear this dress—the neckline is too high for me, and I have an irrational thing about high necklines—but I do think it is so pretty. I’d wear this spiff military shirt as a light jacket. This dress is a little bit witchy/Stevie Nicks-ish, but the lines are clean enough that you wouldn’t feel like you were in costume. And the twist-front detail here is so flattering. 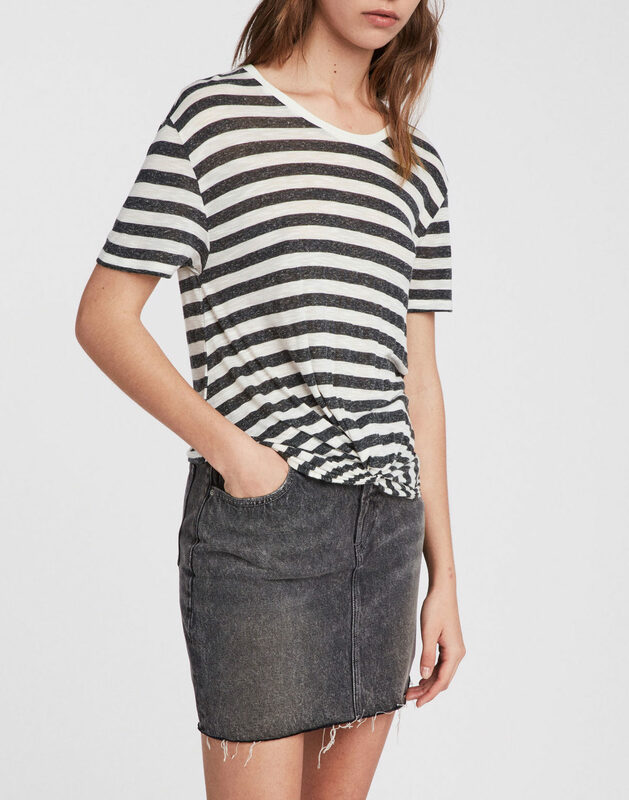 This faded-out, striped tee hangs really well. The fact that this is a paisley print is fun, and the waistline hits at a pretty universally flattering spot. 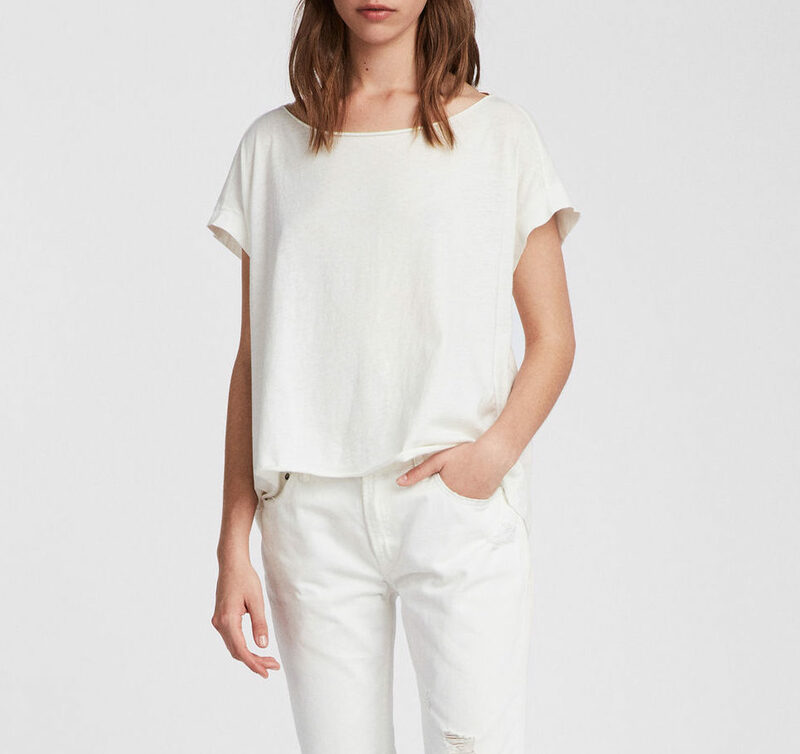 Just a good white tee with a nice neckline. 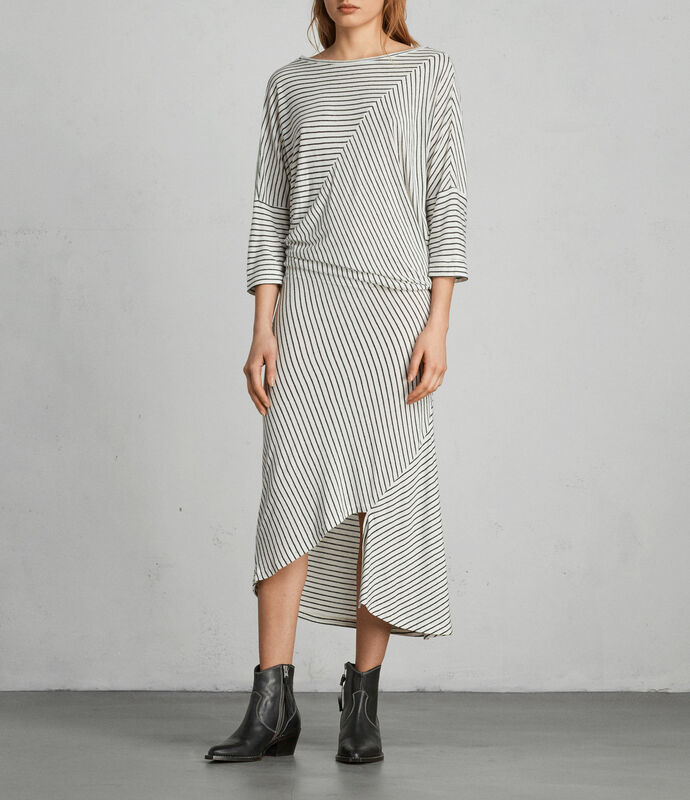 This dress is just totally up my alley: the stripes going off in different directions, the asymmetrical hemline, the three-quarter sleeves—all of this makes me very happy. 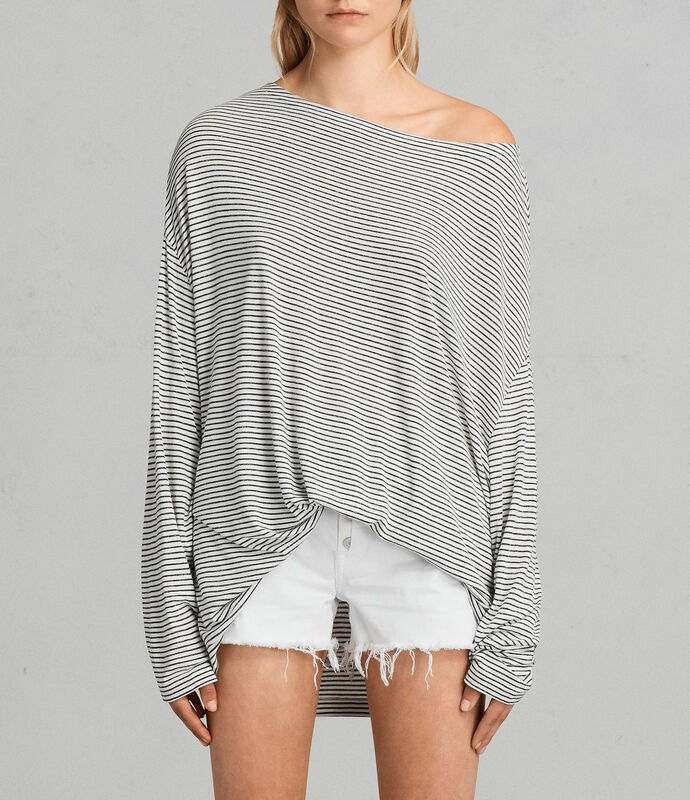 I wouldn’t wear this tee off the shoulder like this, but I do like its excellent slouchiness. 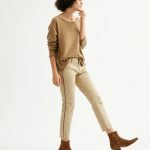 These jogger pants look really comfortable and quite chic. I think you cherry-picked the best of their selections. That twist-front dress is stellar. 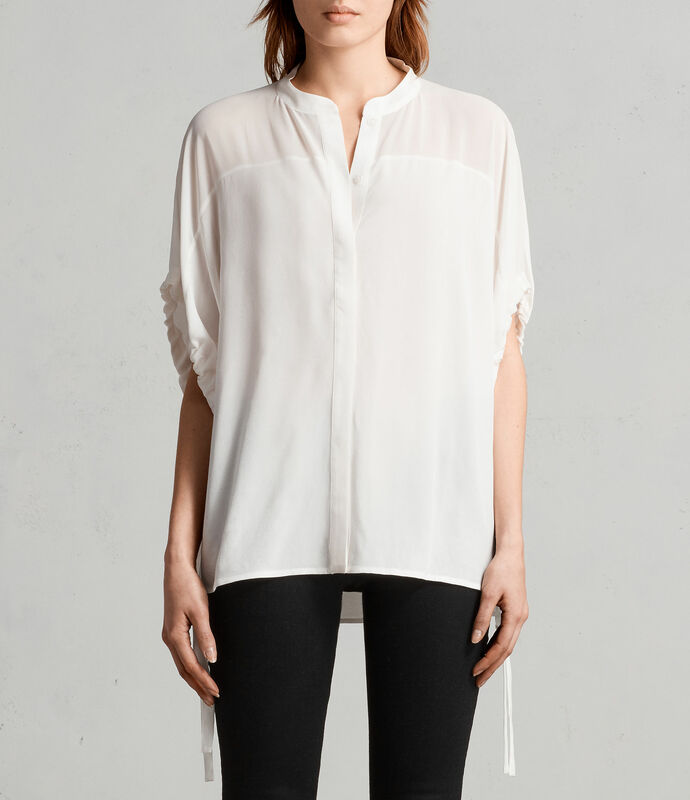 The first shirt is lovely and because I’ve worn the hell out of my other 2 pairs of black joggers, I want these too. The knot-front dress is really, really tight. Order up a size. My advice. LOVE that striped asymmetrical dress! Makes me think of Elizabeth Hawes. 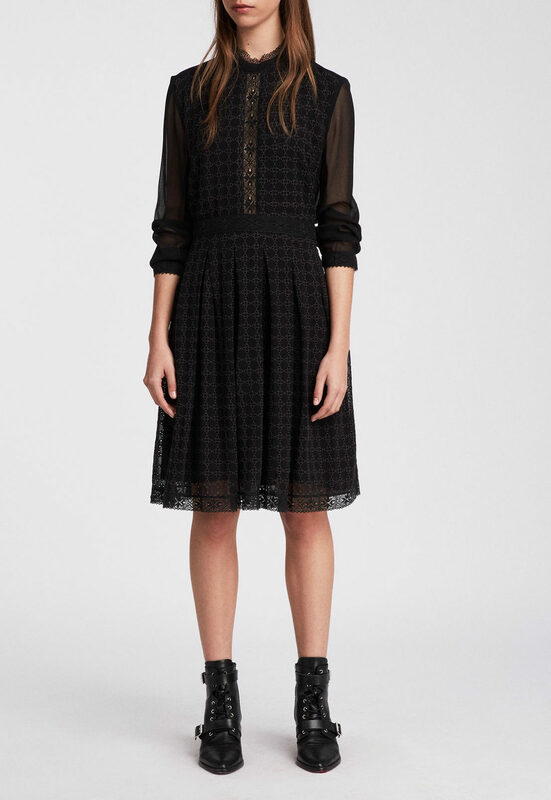 Color me “Stevie Nicks/witchy,” but the Palma Polka dress has my name ALL over it! 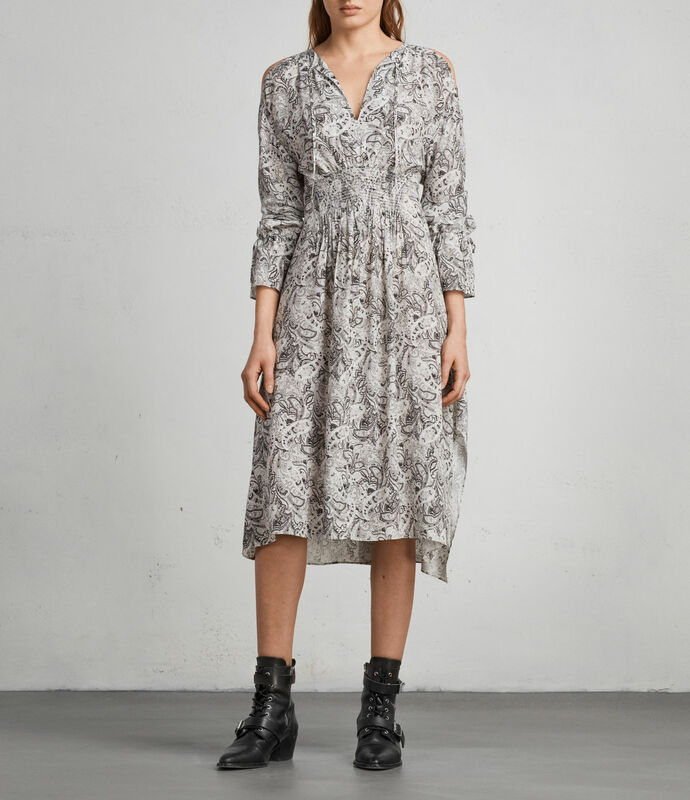 Color me "Stevie Nicks/witchy," but the Palma Polka dress has my name ALL over it! It’s rough when a store makes a regular item look smashing/unique because of a very impractical style piece that casts the spell of hipness over the whole outfit. A necklace, or a shoe, or a haircut(! 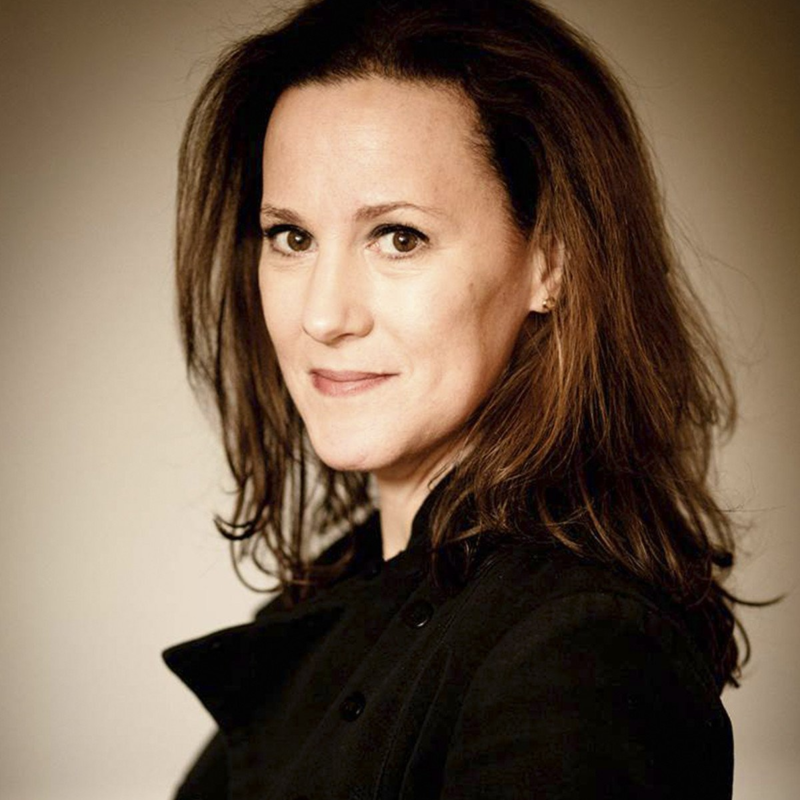 ), or a coat…. Of course that style piece only works in a rare instance so one can’t really buy it (or it sits in our closets underused). It seems like this: The outfits in the photos are inspirational but unrealistic. These companies are not giving us helpful suggestions; they are using an impractical dressing strategy to market us and the planet to pieces. We buy and buy trying to capture that hip quality that never materializes, which leads us to think we need to do more shopping. 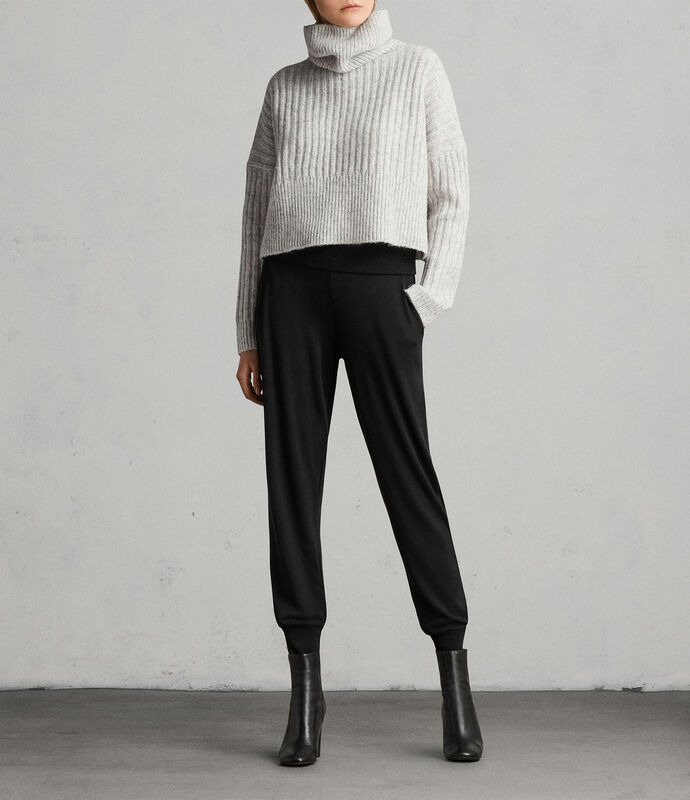 Is the black jogger example more the outfit that is quite chic than the joggers? (due to boots, boxy sweater cropped just-so) Without those things....still special? It's rough when a store makes a regular item look smashing/unique because of a very impractical style piece that casts the spell of hipness over the whole outfit. A necklace, or a shoe, or a haircut(! ), or a coat.... Of course that style piece only works in a rare instance so one can't really buy it (or it sits in our closets underused). It seems like this: The outfits in the photos are inspirational but unrealistic. These companies are not giving us helpful suggestions; they are using an impractical dressing strategy to market us and the planet to pieces. We buy and buy trying to capture that hip quality that never materializes, which leads us to think we need to do more shopping. If a shirt is 100% polyester, I don’t want it. And if I have to buy it, it better be $30 or less. Polyester is just so unpleasant on the skin and does not do my body odor any favors, regardless of how much deodorant I wear. Anyone else relate? If a shirt is 100% polyester, I don't want it. And if I have to buy it, it better be $30 or less. Polyester is just so unpleasant on the skin and does not do my body odor any favors, regardless of how much deodorant I wear. Anyone else relate? Precisely why I’m not buying the $260 Palma Polka dress! 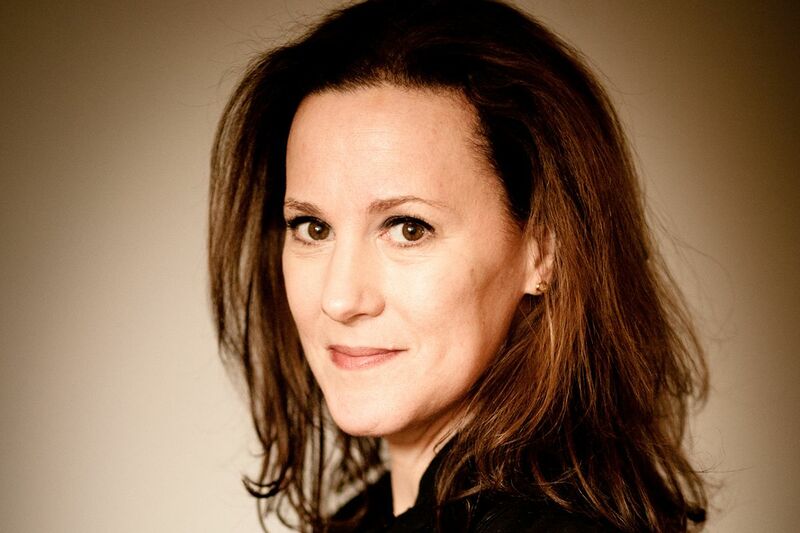 Precisely why I'm not buying the $260 Palma Polka dress! Allsaints quality is pretty hit and miss. Almost imperative to see and feel things in person. Some of their jersey dresses are too see through, but that black one does look substantial. Several years ago I took advantage of one of their big sales and snagged a leather jacket and black draped wool trench. Excellent quality even though the leather jacket is lined in cloth. I’ve worn the heck out of them both. 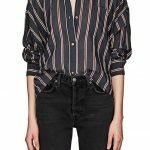 Allsaints quality is very hit and miss. Pretty much need to see and feel their stuff in person. Most of their jersey dresses are too thin (see through), but this black one does look substantial. Years ago I took advantage of one of their big sales and bought a leather jacket and a black drapey wool trench. I’ve worn the heck out of them both. But everything else I’ve bought I’ve sent back for quality/fit issues.